Eh Janam Tumhare Lekhe ~ This life is dedicated to “YOU THE ALMIGHTY” (God). 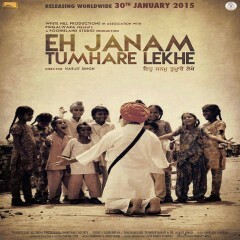 This film is a journey of one man “BHAGAT PURAN SINGH” who treaded a difficult and exhausting path. The journey was made possible by his infinite faith in his mission: the moral values he received from his mother: and courage, vision and determination he received from Guru Granth Sahib. With compassion in his heart he found energy that can move mountains and create miracles. The film is an important chapter in the history of post – partition Punjab. A varied approach to meaningful events would carry great appeal and emotionally connect with the audience. The rich music score soaked in traditional punjabi sounds, Shabads, songs and the culturally rich rhythms emanate fresh waves of sound that the listeners will savour with delight. The tireless research done for the film makes it a very authentic and genuine attempt to recreate the life and the times of a penniless man who calls himself ” a humble sweeper at the footsteps of Gods abode”. He ferried an invalid for many years on his shoulders and over a span of time the burden of every helpless human became a garland around his neck. In his arduous journey he was joined by millions of altruistic human beings who supported his noble cause without knowing the sheer magnitude of the herculean task of the man who undertook it. The film is sure to draw the crowds for its honesty, sincerity, brilliant performances, music and a story everyone will relate with. It is an awe-inspiring journey of a human being who commits a lifetime to serving humanity and preserving the environment.